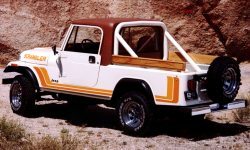 The CJ-8 well known as the Jeep Scrambler was a long wheel base version of the CJ-7. The wheelbase for the Scrambler was 103.5 in in comparison to the 93.3 in wheelbase of the CJ-7. The longer wheelbase and the removable half cab of the Scrambler give it the unique small pickup look without an actual separate pickup bed. This was part of the design and marketing strategy for Jeep at the time. It was brought to market in 1981 a full five model years after the CJ-7 was first introduced. The Scrambler name itself as used among enthusiasts is derived from the appearance package that many CJ-8 Jeeps were equipped with. This included graphics running down the lower portion of the body as well as the word “Scrambler” on the side of the hood. CJ-8 Jeeps also came stock with special edition wheels that differentiated them from CJ-7s. The CJ-8 was made in a special right hand drive (RHD) configuration with an auto transmission and full length steel hardtop known as the World Cab. This model was also very unique in that the rear tailgate was replaced with a hinged style barn door. Only 230 were made in the US however many more were made in South America (Venezuela) and Australia (AUS) where it was known as the Overlander.